Simple wedge : Similar to an axe, cut through the wood and splits it into 2 pieces. The 4-way wedge : Looks like a cross blade and allows the split done into 4 pieces. Professional units come equipped with 4-way wedges as standard or as an optional accessory. The 6-way wedge : Found on high-end commercial log splitters, forces the large log to be split into 6 different pieces. If you buy or think about how to make a log splitter you should check if any additional wedges are available as accessories or within the log splitter spare parts section of your chosen manufacturer. The decision on the right blade type affects highly the speed of your splitting task. Manually Movable : Nearly all log splitter units come with wheels. Check the wheel diameter and material. The larger the wheel the easier and versatile its use. Even for home use you might want to consider what it is like to pull the splitter through the mud of a autumn backyard lawn. Weight : Since the hydraulic cylinder and electric or gas power motor have some weight, make sure you check the total weight of the splitter to see if you alone are able to move it around or if you will always need help when doing your log work. Tow Behind Log Splitter : The "towable" splitters are great for off-site firewood preparation. Especially commercial units, rental log splitters can often be towed behind a pickup truck for easier handling. Safety 2-Hand Switch : The most obvious and simplest safety feature is a switch which must be pressed by both hands at the same time to keep your hands safely away from the blade. Pressing Speed : As mentioned above, the speed at which the ram hits the wood, may cost you a second or two during every splitting cycle, but its definitely worth compared to a finger slammed between the log and the hydraulic hammer. Operating Position : Consider the operating position as the splitter works its way through the log. When the logs fall away, are you operating the machine with your feed next to it? Or does the log splitter allow for safe operation away from the splittering wood? Simple item, but it is amazing to recognize the bad design flaws of some log splitters. As with any tool or machine - make sure spare parts are available for any log splitter model BEFORE you buy the unit. In the case of log splitters, with its hydraulic ram, will most likely run into some need of parts and maintenance. Be it seals , hydraulic liquid (oil) or even the entire hydraulic tank. Do not forget, a log splitter is typically an outdoor machine for rough and heavy duty work. Log splitter parts like the wedge or blade might need some replacement or at least sharpening. Regardless, if you buy your log splitter at your local dealer or over the internet or if you make your own wood splitter, make sure spare parts are readily available, knowledgeable service personnel is provided and on-site service is only a call away. Depending if you are looking for a simple home use log splitter or an advanced commercial model, check out what kind of accessories are offered for your splitter. Log Lift : Especially useful for horizontal log splitters, a log lift moves the wood into the machine. Effortless and safely. 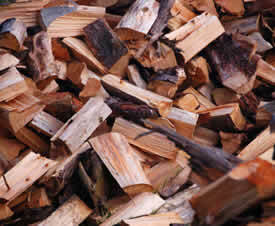 Log Conveyors : Certainly important for professional commercial use of log splitters. Transports the firewood safely to the truck or pile. How to build a log splitter - Where do I get a good wood splitter plan ? For those of you who plan to build you own log splitter, make sure you first get either a good log splitter plan or use some existing log splitter as kind of "role model" for your own make. Usually building a log splitter starts with one or more components you might have left over in your workshop... there is this old hydraulic cylinder in the corner or the old but good motor in the shelve which would be nice "convert" into a log splitter 🙂 . Starting with some basic parts and build your own log splitter around it, is definitely a great way to go. Use this 3-part article to get a good overview on all key components before you start pulling out your welding equipment. Take special care on which wedge you will use and get a log splitter plan with a detailed parts list and check those possible parts suppliers before you think about how to build a wood splitter. Mantis, Troy-Bilt, Blue Max, Timberwolf, Massey Ferguson, Elektra-Beckum, Alko, Ryobi, Brave Products, Powerhouse, Mtd, Northstar, Splitez, Task Force, Split Fire, Yard Machines, Ardisam, Fisch, Mcculloch, Ariens, Steele, Grizzly, Task Force, Swisher,Huskee.